God made men and women to be unique. We are different by His design in order to display the full range of His glory. Because of this, The Church on Rush Creek believes it’s biblical to intentionally connect, train, and empower men in specific ways. The ministry of the Men of Rush Creek is not a silo pulling men out of the body of Christ, but rather exists to strengthen the fiber of men throughout our entire church. We believe that God has created each man to HUNGER for God’s Word, to be BROKEN over our sin and to develop a BURDEN for others. 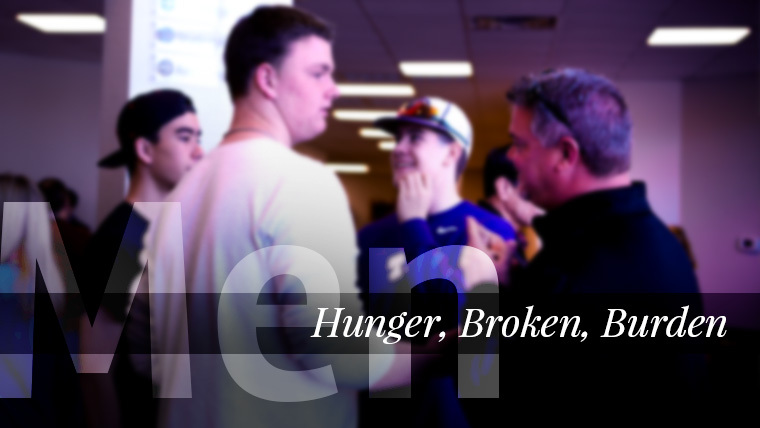 Men’s Quarterly Breakfasts: We gather as men quarterly at each campus for breakfast with the purpose of connecting men and giving them opportunity to hear testimonies of how God is impacting the lives of men through LifeGroups and Fight Clubs. Fight Clubs: We meet in small groups beyond the walls of the church to reach other men where we live, work, and play to help them meet Jesus as we share our lives with them. Fight Clubs are for those willing to fight. Start with people who are hungry and committed to the process. The best place to look is in your LifeGroup. Click here to learn more. Nehemiah Project: As men of God we are called to serve others in need and minister to the poor, the widows and the over-whelmed. Click here to learn more about Nehemiah Project. Our prayer is that God would impact our community and our world through the Men of Rush Creek as we help each other to discover and live out His unique calling for our lives. Men's Breakfasts will occur quarterly on Saturday mornings at 8am. Specific dates are announced per campus. Fight Clubs are designed so that men can meet at restaurants, coffee shops and other public gathering areas anytime the men find convenient to their schedules. Nehemiah Projects will be distributed as the needs of the community arise. Please make yourself available to serve by signing up on the Nehemiah Project page.